I'm happy to announce that my first book, my autobiography, is completed. You can order it now and receive it immediately via Amazon.com. A new e-book version is about to become available which supersedes the version released earlier in December. Songs of Petroleum is about to get in-depth reviews. Enjoy the passages and photos below and read a brief description of the book by Albert Bates, author of the awesome new book The Biochar Solution. Since 2004 I had been working with literary agents and publishers to produce a book not about my life but on my findings from two careers: oil-industry analyst at Lundberg Survey, and "eco-warrior" fighting petroleum pollution, car culture and sprawl development. After various drafts and receiving good advice, I realized that an autobiography would be the wisest choice as a first book. This is probably the best way I can get a message out and hope to contribute to an historic turnaround: society's relationship with petroleum dependence must be seen as unhealthy, and we can begin a saner, happier way of living today. What's not to like about depaved spaces for gardens, Pedal Power Produce, Sail Transport Network, and a secure local economy? Ordering: Since print-on-demand self-publishing has come of age, one can get a book out directly with no added delays from a conventional publisher. To order, please use our secure web form provided by PayPal, most major credit cards are accepted. We will use the address that appears on your PayPal or credit card transaction unless otherwise specified. You may also order through the mail, please send a check for $18 (shipping is already included) to: Culture Change Press, P.O. Box 3387, Santa Cruz, CA 95063 USA. My "epic personal tale:" (Ahem,) I often feel like I've had an all-too-interesting life. But I'm glad to tell my story and make you laugh -- or take you through the triumphs and sorrows I experienced in my personal life spanning two unique careers. I sailed from Los Angeles to Greece for quite an education as a teenager. But what was a proud family saga ultimately turned into the worst kind of Hollywood soap-opera that has occasionally been uncomfortably public: ... [deletion of a legal reference, January 2013]... 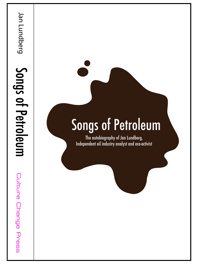 In between the recounting of our 1960s' world cruise and today's family disgrace, laced with harrowing sailing adventures and 1970s' Me Generation decadence, I pass along to readers of Songs of Petroleum my discoveries in the oil industry and in the environmental movement. Of greater personal importance to me was raising two artistic daughters and becoming a musician. I stopped punching the corporate time clock in 1988. But it hasn't been easy! And the fight to save Mother Earth is still on. We had very special guests over for dinner, such as one night in perhaps 1962 when I was ten: peace activists had sailed their boat into an atomic-bomb test area to stop the aboveground blast. I thought what they did was important, and I didn’t see them as helping any enemy. Meeting such people can leave an impression on a boy that shapes him. I emulated this kind of social exposure for my daughters, who through me met civil-disobedience protesters involved mainly in defending ancient forests. Off the island of Poros, just south of the Saronic Gulf, we had a close call. Sailing along on a splendid afternoon, well away from land, we were jarred when the Passat’s keel hit ground. 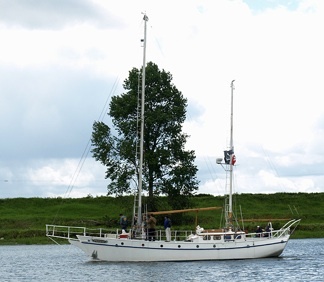 My friend Chuck Wertime was most of the way up the main mast, sitting on the spreaders, and the impact almost knocked him off to fall to the deck. The boat stopped abruptly, leaned, and stayed leaned over. My father, who was in command, was drunk as a skunk on ouzo. I have always blamed him for the accident, but now that I think about it I wonder what a sand bar was doing far from land where there were no rocks or buoys. I have to blame myself for being too relaxed and not checking the charts and our position carefully enough. In a short time a large motor yacht came by to help us. We threw them a line and they pulled us off. We were on our way, putting Poros behind us, when a naval skiff caught up with us. Without permission, three officers boarded. They ordered us to turn back and follow them to port, and I knew it was because the motor yacht owner wanted to claim possession under international marine law of salvage. However, we were uncooperative. My father was still drunk and was probably useless and intimidating to talk with. Our Greek friend Vasili Condoyannis (now a successful chandler, broker and charterer) was at the wheel, but he would not let go of it as ordered, even when an officer tried to wrest it from Vasili’s strong hands. One of the officers spoke to my sister, a big mistake. She let him have it on the face with a hard slap without a word. After a while, as we were continuing on our way and taking the skiff and its crew far from Poros, the intruders gave up and got in their boat and went home. I don’t remember if they had guns, but I know that elsewhere in the world such as the U.S. we would have had guns pulled on us. The next day in Hydra my father and I went to visit the motor yacht’s owner to thank him, but he would not deign to show himself. 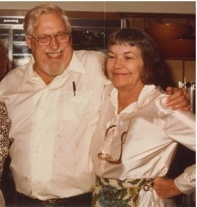 As Oil Guru, Dan [Lundberg, my father] earned a regular Nightly Business Report commentary spot on the Public Broadcasting System television network in the early and mid-1980s. I helped edit or proof-read just about every one of those commentaries, and we delighted in the occasional opportunity to attack gasohol and ethanol for causing "agricultural strip mining" (as we did in the Lundberg Letter). We even took a swipe at the White House policy of supporting the Contras in Nicaragua. However, when I wrote up a commentary for my father that advocated a restructuring of the work force's geographic relationship to the work place, in order to slash oil use, he rejected it as risky and too daring to pursue — even though he knew I was correct. Fall of 1996 had feelings running high as the last of the ancient redwood trees continued to be clear-cut, often on steep slopes. Later in October about 50 of us got arrested for riding our bikes in a big “Critical Mass” protest in support of defenders of ancient-redwood groves. 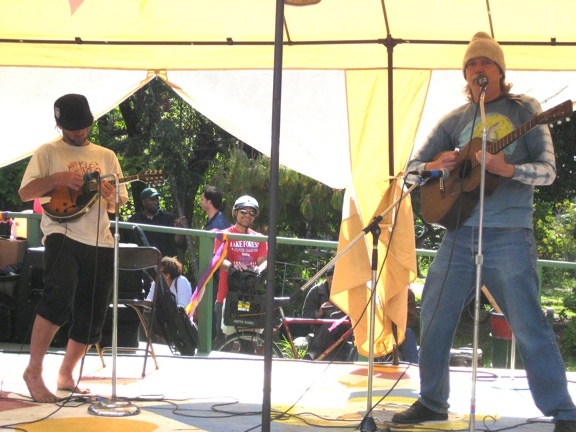 The day we picked was the National Day of Protest to Stop Police Brutality, Oct. 22, 1996. On a rainy Tuesday afternoon, almost 200 of us set out from the Arcata Plaza for the courthouse in Eureka, the scene of much injustice toward our brave friends: Crow, Nature Boy, Spirit, Dijon, Garlic, Grasshopper, Dirt, Pond Scum, River, Ayr, Timber Wolf, Buckwheat, Screech Owl, Sleeper, Lizard, Sawyer, Felony, Almond, Peanut, Josh, and many more. (Why these nicknames? 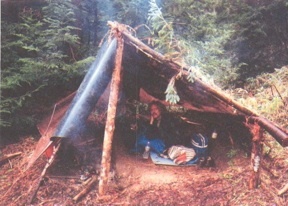 Protesters feel that FBI or police informants or agents de provacateur don’t need to know identities of those planning to trespass onto corporate timber land, for example.) New eco-warriors were in the very making as we streamed down Highway 101 with excitement, as the cows in the pastures beside stampeded in the same direction just for fun. We were taking both lanes as well as the bike lane, blocking the speeding polluters behind us. But we were traffic. Ahead we saw a strange sight: coming at us going the wrong way was a mass of Highway Patrol cars and motorcycles. Appendices that shed light on petrocollapse, for example, are presented perhaps as milestones in my career, and are possibly of use to those looking for more than an entertaining story. "What you don't know doesn't hurt you" says Jan Lundberg, referring to his decision to leave behind family wealth and a promising career as a petroleum analyst to live on the edges of society without money or social advantage, sleeping on couches and then checking under the cushions for spare change. "My biggest desire was to be sitting on the side of the road with my guitar, not knowing where my next meal was coming from," he writes. While that choice proved harder and more consequential than he had imagined, it enabled him to pierce deep-seated illusions and gain precious cultural and ecological insight that he shares in this epic personal tale. "Sometimes a new song I'm writing or practicing is the only thing that kept me going," he says. This book is that song, about a world living on the edge, and Lundberg's advice is all about staying loose, building resilience, and understanding what's coming. 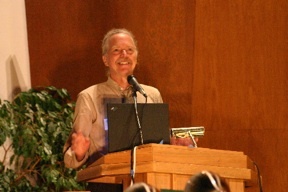 - Albert Bates is author of The Financial Collapse Survival Guide and Cookbook and 14 other books on energy, environment and history, including The Biochar Solution: Carbon Farming and Climate Change. Thank you from Jan and the Culture Change team of largely two-wheeled and sail-cloth travelers and activists! It's about my favorite way to pass time also. Congratulations and well done, Jan! Jan - we have some degree of kinship in views on the world. I, too, have spent many hours at sea on a sailboat and love to backpack in the eastern version of the redwoods on the Appalachian Trail. My wife and I are very conscious of our footprint and recycle. She spent 5 years helping to raise funds for the Chesapeake Bay Foundation and still volunteers even though we now live a long way from the Bay. However, my view of the energy supply options leads me to strongly favor nuclear energy since it has the ability to provide the most useful energy with the least impact on the environment because of the concentrated energy in the fuel. In addition to cruising the oceans on emissions free sailboats, I spent even more time cruising them on emission free submarines that could operate for a decade and a half on a fuel mass that was just a bit more than my own body weight. Submarines have a motto that is very similar to backpackers - "remain undetected" is an awful lot like "leave no trace." So, my question for you, and other environmentalists is why are you opposed to developing and using nuclear fission technology? If your autobiography is half as interesting as the story on this web page, then I'm looking forward to it. Well done. I just got a nice card from Culture Change Press Distribution Center - asking if I received a copy of Songs of Petroleum - as your records show that I did get one!? In fact I didn't get one, for some reason, but had dismissed it as not worth worrying about ! I still enjoy the regular emailed info and stories... Though I'd still like a copy of the book ! Cheers, all the best, N.